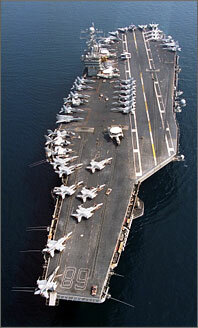 An aerial view of the USS Nimitz. The journey the film CARRIER chronicles began May 7, 2005 when the USS Nimitz departed Coronado, California as part of the global war on terrorism. The nuclear-powered aircraft carrier sailed 57,000 ocean miles in the ensuing six months, pausing at ports throughout the Western Pacific and Arabian Gulf, including its first ever stop in Australia, before returning home Nov. 8, 2005. It was the 11th deployment for the ship named in honor of Fleet Admiral Chester W. Nimitz. Since commissioning May 3, 1975, the ship was active in the Iranian Hostage situation, had its aircraft fired upon by Libyan pilots in 1981 and helped provide security for the Olympic Games in Seoul, Korea. Nimitz has participated in such operations as Desert Storm, supported combat operations in Afghanistan and Iraq and strengthened various United Nations initiatives as the only battle force available. During her illustrious history, the Nimitz and her crew have been honored as the most efficient and foremost aircraft carrier in the Atlantic in 1976 and also for the Pacific in 2003. Photographs of the USS Nimitz and its 2005 deployment taken by the filmcrew during the production of the series CARRIER. The Nimitz reaches over 23 stories high from the keel to the top of the mast. The Hangar Bay extends for most of the ship’s length. It is used for major repair and shelters the aircraft not needed for that day's flight schedule. Four distilling units enable Nimitz engineers to make over 400,000 gallons of fresh water a day, for use by the propulsion plants, catapults and crew. The Food Services Department provides 18,000-20,000 meals a day. The Nimitz can stock at least 70 days of refrigerated and dry storage goods. One barber shop trims over 1,500 heads each week. The Post Office processes more than one million pounds of mail each year. Six doctors, including a general surgeon, provide everything from surgery to hydro-therapy. The ship also has five dentists. The Nimitz also features a 53-bed hospital ward, a three bed ICU, and acts as the hospital ship for the entire Nimitz battle group. Three chaplains conduct daily religious services in an interdenominational chapel. Two nuclear reactors provide more power to take up less space than traditional ship propulsion. This allows the ship to store 50 percent more ammunition and almost twice as much aviation fuel as the largest conventional carrier.